Meet the new Gucci man, he is a stylish 20-something, tech-avvy, mixes sportswear with tailored pieces and wears floral motifs. The spring/summer 2014 season is all about remixing classics with a modern takes and futuristic influences. Milan Men’s Fashion Week showcased some of the most trend-forward looks for SS 2014, from new takes on traditional looks and fresh graphic prints. The runway dawned looks from Calvin Klein Collection and Prada, both collections were true to the aesthetic, but offered a sporty feel. At Gucci, the collection curated by Frida Giannini is a mix of statement and lifestyle pieces. We at FASHIONOTES love the idea of floral motifs in menswear, at Gucci the look encompassed sportif with a futuristic vibe, cool tailoring and florals with a twist. The current trends in menswear are fresh and truly add a contemporary feel to menswear staples. While we love the floral trend in women’s wear, we can’t help but feel that Gucci “nailed it” when it came to the look. Currently the design house’s runway show has 3,414 hits since its release, four days ago, scoring viral potential. So, tell us what you think about the floral trend in menswear? Use the hashtag #MMFWtrends via twitter @FASHIONOTES! 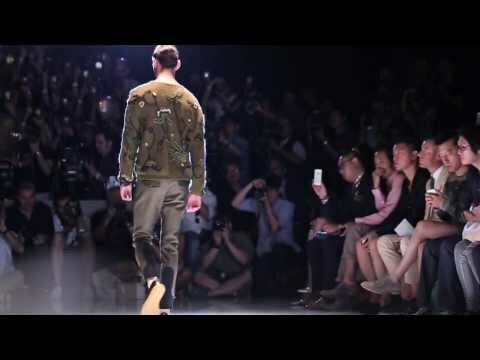 Explore the runway by Gucci below.